Felder & Associates is pleased to announce that its rehabilitation project of the historic Greyhound Bus Depot, now a new restaurant, The Grey, has received a prestigious Historic Savannah Foundation’s (HSF) 2015 Preservation Award. Located at 109 Martin Luther King Jr. Boulevard within Savannah’s Historic District, the property was originally designed by architect George D. Brown and was constructed between 1937-1939. “We are very pleased this project was recognized by the Historic Savannah Foundation,” said Brian Felder, AIA, managing principal of Felder & Associates. “The Grey is a rare and excellent example of the Streamline Moderne style of architecture in Savannah. Our priority was to preserve the distinctive features, finishes and construction techniques, and match new features to the old in design, color and texture.” Replacements of old missing features were substantiated by pictorial and documentary evidence, and included replication of historic materials as recommended by the National Park Service and following the Secretary of Interior Standards for Rehabilitation. Gretchen Callejas, the project architect for Felder and Associates, ensured the proposed interior and exterior modifications remained true to the original design and those designs met the Department of Interior guidelines for preservation. The space was conceived by New York–based firm Parts and Labor Design with Bloomquist Construction Company, Inc., serving as general contractor. Owned by New York entrepreneur John O. Morisano and offering up a distinctively modern southern cuisine masterminded by executive chef Mashama Bailey, The Grey opened last December. In February, the restaurant was named a semifinalist for the James Beard Award in the best new restaurant category. It has been prominently featured in Architectural Digest and the Washington Post. 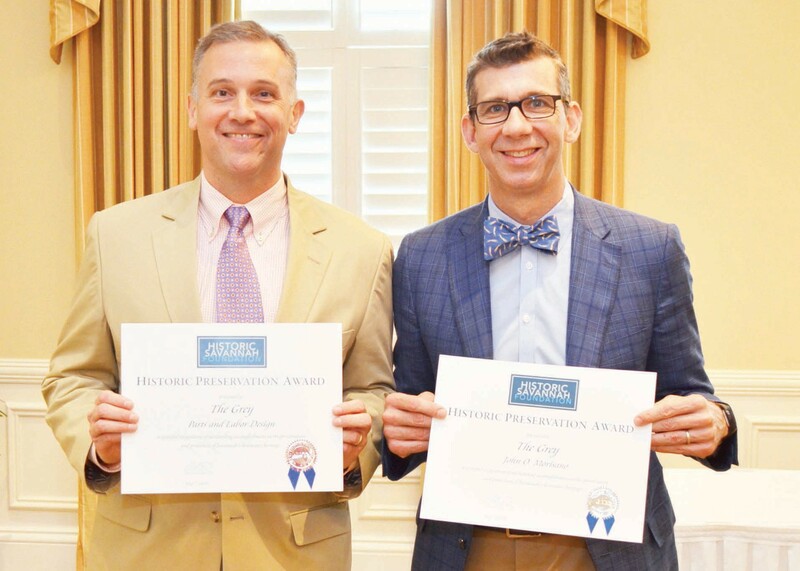 Each year, the HSF celebrates the best of preservation by presenting Preservation Awards to individuals and organizations whose contributions demonstrate excellence in historic preservation in Savannah and Chatham County. The Awards are judged for the success they have achieved in the preservation, rehabilitation, restoration and interpretation of local architectural and cultural heritage.